A motocross rider will average 95% of their maximum heart rate during a race. That’s somewhere around 180-195 bpm, depending on the age and fitness of the individual. Demanding a seriously high output from the heart for anywhere between 15 and 40 minutes will generate a serious amount of physical stress – and that is just one heat. In addition, the upper extremities are at the mercy of a 200+ pound machine, requiring a substantial amount of effort to manage. To steer and maintain control of the bike is mentally and physiologically intense. This isn’t even tanking into consideration the terrain, impact of vibration, and speed of travel. 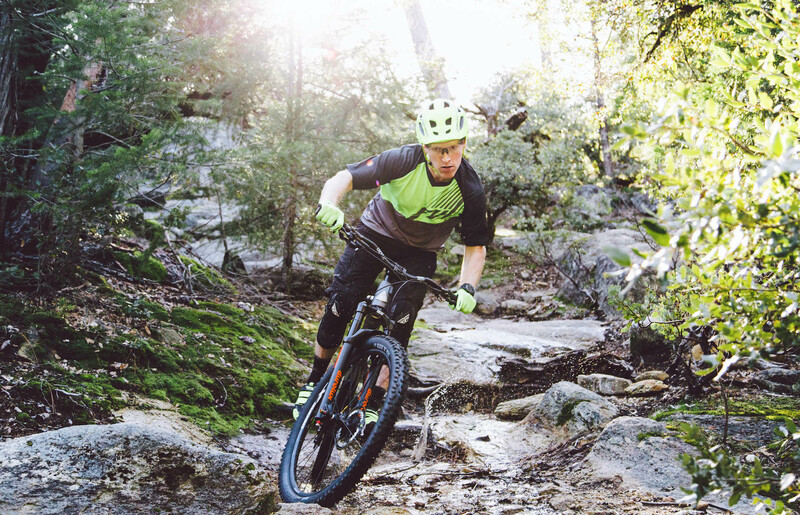 If you participate in motocross, enduro or downhill mountain biking, you’ve probably heard the term “arm pump” (the common name for chronic exertional compartment syndrome, or CECS). You may also have suffered from grip fatigue, forearm or hand weakness and numbness after a hard effort. 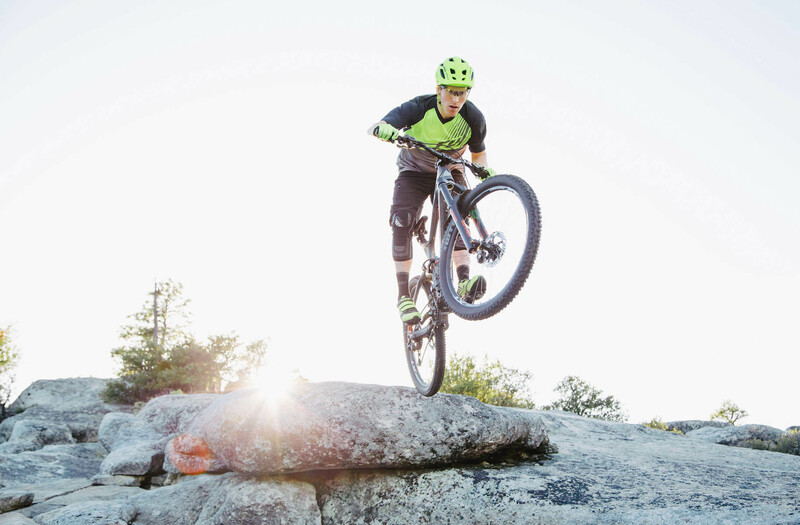 Between 20-25% of mountain bikers have reported tingling and loss of strength in the hands, mainly associated with overuse injury and poor bike fit. Three-time North American Enduro Champ, Kyle Warner. Sup, Kyle! The microtrauma associated with muscular overuse can lead to CECS and other related forearm and hand injuries. 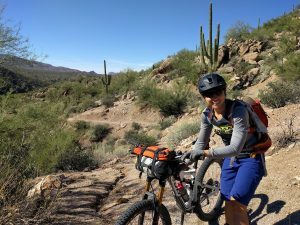 During intense or prolonged riding, poor upper body fit to the bike, high levels of adrenaline, insufficient training and muscular strength, and increased amounts of pressure on nerves that run through the forearm, wrist and palm can all exacerbate and lead to compromised performance. If left unaddressed, these injuries may become seriously problematic, leading to long-term physiological damage. However, the good news is the various factors contributing to arm pump and related conditions can be identified and corrected. Braaaaaaap! What are the causes? Like most systemic complications, there are many factors and pathways that feed off of each other. The physiological interplay that leads to arm pump, weakness, fatigue, numbness and/or pain in the hand and forearm is not exempt. We attempt to break it down for you into several sections, explain how each aspect is involved in the result, and then provide some recommendations on how to alleviate the symptoms and prevent the onset of it in the first place. A certain intensity of riding exists within sports such as downhill mountain biking or AMA Supercross. There is a synergistic interplay happening between the extensor and flexor forearm muscles in order to help manage the machine, as well as the body’s center of gravity and balance. The harder the grip on the handlebars, the more muscle fibers and overall tension required to maintain posture and bike control. And just because the type of tension may be partially isometric, does not mean the musculature will not fatigue. This is a common misunderstanding. The forearm compartment can easily build up pressure due to edema, hypertrophy and blood pooling. Elevated amounts of intracompartmental pressure lead to pain – the fascia enveloping the muscle becomes too tight, as it is not elastic. This additionally leads to transient ischemia (inadequate oxygen supply), compromising metabolic performance. Grip strength is a useful indicator of overall upper extremity strength. Several factors may cause loss of grip strength and power. Lack of muscular tone and mass in the hand/forearm is a major contributor. Just like a couch potato can’t wake up one sunny morning and run a marathon, training is necessary to provide the proper tone and endurance to withstand the energy requirements demanded by the sports mentioned here. Simply put, the more you train your muscles, the more they will adapt to the particular stresses placed on them. This is part of the general adaptation syndrome (GAS), where specificity of training and periodization are aspects of training necessary to promote muscular adaptation. In addition, as demand increases, more muscle fibers are recruited. So the more you have in the first place, the easier on the body it will be to handle high-demand work. 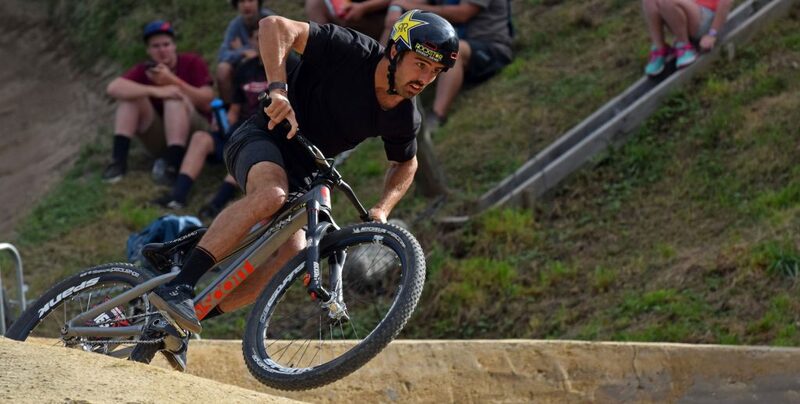 Two separate studies, one assessing the cardiopulmonary demands of motocross, and the other analyzing the physiological demands on downhill mountain biking, found competitive participants suffered from a loss in grip strength anywhere between 5 and 16 percent. Additionally, a major limitation of both studies was the duration, as riders often complete more than 15 minutes of MX riding, or do multiple downhill runs. We therefore could assume that the loss in grip strength would be even greater during an actual event or series of events. Vasculature: The exact mechanism behind CECS/arm pump is unclear, but it has been hypothesized that it has to do with an attenuation of blood flow in the lower arm and hand. This ultimately leads to blood flow stagnation, edema and increases forearm compartment pressure. As the mental and physical intensity of the ride increases, grip tightens on the handlebars. Larger amounts of muscle tension are now required. In return, blood flow must increase to deliver nutrients and oxygen, and remove metabolic byproduct. However, the amount of isometric contraction required to increase force of the grip may inhibit oxygenated blood flow into the musculature, also decreasing muscular perfusion. 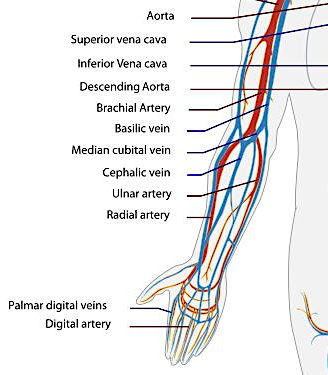 Simultaneously, venous outflow is severely attenuated, trapping blood in the forearm. (Veins work via a “muscle pump,” where repeated contraction moves blood forward, and valves within the veins prevent backflow so blood only moves toward the heart. Without this, blood does not flow and ends up pooling). In addition, the lack of blood flowing into the forearm and hand prevent adequate supply of fuel and oxygen to meet metabolic demands. This can lead to inadequate force production and lack of grip strength, inevitably leading to fatigue and symptoms of arm pump. It’s still under debate whether ischemia is a significant cause of the pain associated with arm pump, even though this has been one of the more historically accepted pathophysiological explanations. Nervous system. The autonomic and peripheral nervous systems respond to our voluntary choices to play hard. In response to the demand for fuel and work, the sympathetic nervous system (our “fight or flight” response) drives a vast array of physiological changes that allow perspiration to increase, heart rate to go up, pupils to dilate, and respiration to meet our demand for oxygen. In addition, the peripheral nervous system, comprised of nerves responsible for sending signals back and forth between skeletal muscle and the central nervous system, has to respond to sensory input and deliver all motor output. Increased and prolonged pressure on the median and ulnar nerves can (and usually will) lead to numbness and loss of function in the fingers (see our article on Ulnar Neuropathy and Cycling for more information). When the nerve becomes entrapped or compressed, both sensory and motor function cause loss of feeling and finger flexion and extension. That behavioral and emotional drive pushes the body to it’s limits, especially when thoughts are not controlled, increasing carbohydrate fuel requirements, sketchiness of technique and overall risk. It promotes increases in grip force of contraction as the rider traverses rough, irregular terrain and turns. Movement toward anaerobic fuel utilization, increases blood flow and compartment pressure result, which inevitably leads to forearm and hand fatigue. In addition, a study conducted in 2008 had shown increased levels of catecholamines in the urine during and after multiple simulated 30-minute off-road motocross heats, providing more support for the metabolic demands of the sport during and post-exercise. Kyle Warner of Marin Bikes. Photo courtesy of Paige Nicole Photography. What can be done to prevent or alleviate these issues? Stress and relaxation management. Stress is a major contributor to physical reaction. Emotional control can help alleviate symptoms associated with fatigue by lowering the initial adrenaline response, preserving fuel and maintaining a lower heart rate. In addition, practicing stress-reduction and mindfulness techniques will increase performance and endurance within the race, perpetuating positive control of riding technique, and decreasing the physiological response of over-gripping the handlebars when unnecessary. Furthermore, being aware is step one in alleviating over-gripping and excess muscular tension. Practice how to relax your grip while on the bike. This will allow blood to successfully leave and enter the forearm compartment, reducing pressure and allowing proper delivery/removal of nutrients, oxygen and waste products. Strength training. Anything a rider can do to improve muscular strength and tone will ultimately assist. Upper and lower arm exercises should be included in any regular training routine. Dumbbell wrist curls and reverse curls will strengthen the forearm flexors and extensors. Variations on triceps extensions and presses and biceps curls should suffice for the upper arm. For a list of exercises, check out ExRx.net. All of the information presented on this site is derived from the National Strength and Conditioning Association (NSCA) and American College of Sports Medicine (ACSM) guidelines and procedures. 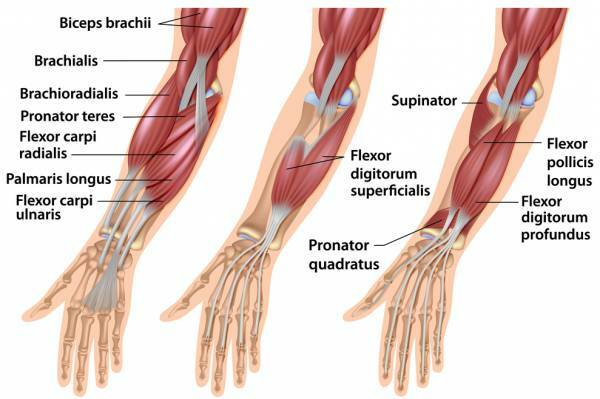 (Here are the links to forearm exercises and upper arm exercises). Stretching. Flexibility is one of the five components of overall fitness. Tight muscles always inhibit optimal performance. Ideal muscle length can be achieved by incorporating flexibility exercises 2-3 times per week, with improvements being seen after 3-4 weeks. Handlebar position and fit. Keeping an ideal wrist angle will prevent nerve entrapment within the forearm or wrist, and decrease the likelihood of numbness and loss of contractile ability. The wrist should be in a neutral position, with only about 15 degrees of play to shift and use the brakes. Furthermore, note the position of the brake levers, shifters, and the sweep of your bars. All of these things can be adjusted to attain an ideal arm and wrist angle, preventing strain and injury. Proper fit will decrease pressure on the palm in unwanted places, preventing the onset of symptoms associated associated with ulnar and/or medial neuropathy. Gloves. Wear padded gloves. To piggyback on #3 above, padded gloves have been shown to alleviate pressure associated with ulnar neuropathy, preventing the onset of muscular numbness and paralysis. Grips. Grip circumference can play a role. Granted, a lot of this is personal preference, but there is validity to the science. The smaller the grip circumference, the more flexed your hand/fingers must be to wrap around and hold onto the bars. This increase in tension can lead to fatigue in the hand and loss of grip strength. Elbow Pads. How tight are they? Remember the causes – decreased blood outflow from the forearm – and think about how tight your elbow protection is. If it is too tight, it hinders circulation and could exacerbate the problem. Find the middle ground and get pads that fit snugly and properly. Many manufacturers put sizing charts on their websites, so it is worth measuring the circumference above and below your elbow to ensure you have the right fit if you think you do not. If you are one of those unlucky souls that has tried just about everything, you can go under the knife. There are several (somewhat) controversial surgical techniques used to relieve pain related to CECS, typically used when non-operative treatments have failed. Several studies show performing a partial fasciectomy or fasciotomy to be successful in compartment decompression. Both treatments surgically “release” the fascia surrounding the superficial flexor muscles through fascicular removal or incision. Partial fasciectomies dissect away a portion of the muscle fascia surrounding specific muscles, however less invasive/extreme yet equally successful treatments have emerged. Endoscopic fasciotomies have been shown to end in very positive results, with fast recovery and a return to normal training in 4-6 weeks. Ahmed, T. (2013). The effect of upper extremity fatigue on grip strength and passing accuracy in junior basketball players. Journal of human kinetics,37(1), 71-79. American College of Sports Medicine. (2013). ACSM’s guidelines for exercise testing and prescription. Lippincott Williams & Wilkins. Ascensão, A., Azevedo, V., Ferreira, R., Oliveira, E., Marques, F., & Magalhães, J. (2008). Physiological, biochemical and functional changes induced by a simulated 30 min off-road competitive motocross heat. Journal of sports medicine and physical fitness, 48(3), 311. Balduini, F. C., Shenton, D. W., O’Connor, K. H., & Heppenstall, R. B. (1993). Chronic exertional compartment syndrome: correlation of compartment pressure and muscle ischemia utilizing 31P-NMR spectroscopy. Clinics in sports medicine, 12(1), 151-165. Bong, M. R., Polatsch, D. B., Jazrawi, L. M., & Rokito, A. S. (2004). Chronic exertional compartment syndrome: diagnosis and management. Bulletin-Hospital for Joint Diseases, 62(3-4), 77-84. Brooks, G. A., Fahey, T. D., & Baldwin, K. M. (2005). Exercise physiology, human bioenergetics and its applications.New York: McGrawn-Hill. Burr, J. F., Drury, C. T., Ivey, A. C., & Warburton, D. E. (2012). Physiological demands of downhill mountain biking. Journal of sports sciences, 30(16), 1777-1785. Grange, J. T., Bodnar, J. A., & Corbett, S. W. (2009). Motocross medicine. Current sports medicine reports, 8(3), 125-130. Jans, C., Peersman, G., Peersman, B., Van Den Langenbergh, T., Valk, J., & Richart, T. (2015). Endoscopic decompression for chronic compartment syndrome of the forearm in motocross racers. Knee Surgery, Sports Traumatology, Arthroscopy, 23(9), 2522-2527. Konttinen, T., Häkkinen, K., & Kyröläinen, H. (2007). Cardiopulmonary loading in motocross riding. Journal of sports sciences, 25(9), 995-999. Pedowitz, R. A., & Gershuni, D. H. (1995). Pathophysiology and diagnosis of chronic compartment syndrome. Operative Techniques in Sports Medicine, 3(4), 230-236. Winkes, M. B., Luiten, E. J., van Zoest, W. J., Sala, H. A., Hoogeveen, A. R., & Scheltinga, M. R. (2012). Long-term results of surgical decompression of chronic exertional compartment syndrome of the forearm in motocross racers. The American journal of sports medicine, 40(2), 452-458. The mission of truPhys is to construct a bridge between the common public and health information published in well-ranked, peer reviewed scientific journals, with the foundational intention to educate. arm pump, cecs, cycling, exercise, motocross, mountain biking. Bookmark. ECG Knowledge Bank – Continuously Updated! Is Aspirin an Ergogenic Aid?